It’s going down June 19th at the Palms Casino in Vegas. Here’s a breakdown of the fights. Always a crowd favorite, “The Hammer” is coming off his “victory” over Jon Jones at the last TUF finale. His always-improving stand up game is backed up by his solid wrestling background. Look for him to box initially to set up takedowns for his ground and pound. 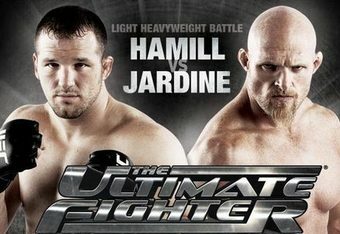 Jardine “The Dean of Mean” is coming off three straight losses to some of the LH division elites (Rampage Jackson, Thiago Silva, and Ryan Bader). His unorthodox style of striking can present issues for his opponents and his keys to victory are avoiding takedowns while utilizing effective leg kicks as he did versus Chuck Liddell. McGee, the now clean former heroin addict, used his grinding never-say-die attitude to surprisingly earn a spot in the final. As an underdog during most of his fights on the show, he earned a clear win over the talented Brad Tavares in the semi-finals and also owns a win over former TUF 9 member DaMarques Johnson. He proved that he can stand and bang or take the fight to the mat. McCray’s season looked to be over after losing to Josh Bryant early, but an injury gave him a second chance at Bryant in the other semi-final. Following new coach Rich Franklin’s advice for preserving energy, the seemingly always gassed McCray got his revenge and narrowly edged Bryant. But can he do more than his standard thai clinch knee and lazy uppercuts? Lets hope so, but look for McGee to emerge victorious. The A-Train looks to continue his undefeated ways. The former Arizona State All-American wrestler in 1996 & 1998 got a late start in the UFC, but is making up for lost time. Leben, a former TUF cast member, is polarizing as they come. He is most famous for urinating on people’s beds, getting busted for steroids, being on the receiving end of Anderson Silva’s fists and knees, and pretty much the most awesome tattoo in the world (a samurai holding a bloody katana and a decapitated head). “The King” appears to be regulated to a lightweight division gatekeeper, while the Russian-German Siver is worth watching for his famous spinning back kicks/punches. Print article This entry was posted by Bret Freemyer on June 15, 2010 at 12:03 pm, and is filed under News, Sports. Follow any responses to this post through RSS 2.0. Both comments and pings are currently closed.